Keith Cozart, known as rapper "Chief Keef." 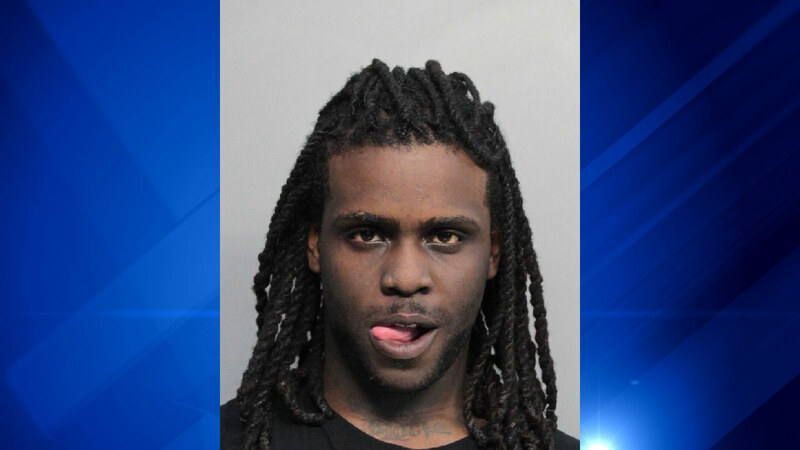 MIAMI BEACH, Fla. (WLS) -- A 21-year-old rapper known as Chief Keef was arrested on a DUI charge in Miami Beach over the weekend. A police report said around 4 p.m. on April 8, officers saw a man get out of a green McLaren that was stopped at a red light in the 200-block of 12th Street, run to a Nissan Altima and hand a bag to a man in the front passenger seat. A "green, leafy substance" was inside the bag, officers said in their report. When the man, identified by police as Cortez McElrath, saw the officers, he ran back to the McLaren and tried to get in. But police held him at gunpoint with a stun gun and put him in handcuffs. Police said Chief Keef, whose real name is Keith Cozart, was driving the McLaren. Officers saw Cozart moving his hands around in the car and was also held at gunpoint with a stun gun, the report said. Officers saw the man driving the Altima shove what police suspect was a bag of marijuana and a baby bottle with syrupy liquid in it under his seat. Police then arrested three people who were inside the Altima. Cozart, according to the police report, had "bloodshot, watery, droopy eyes and mush mouth." He also had a cup filled with a liquid known as "sizzurp" or "purple drank," a drink made with codeine-based cough syrup, soda and jolly ranchers, police said. After failing a field sobriety test, Cozart told the officer, "It's ok, when you find weed in my urine, I'll just get my attorney to get my marijuana card," and added, "You will find weed in me." Cozart was charged with DUI and McElrath was charged with possession of marijuana. Chief Keef has had numerous run-ins with the law, including being questioned by police in a home invasion in Los Angeles in January. In 2015, the rapper had a hologram concert shut down by police in Hammond, Ind. The three people in the Altima, Eddie Bryant, Devante Reaves and Jamil Perkins, were also arrested. Bryant and Reeves were both charged with marijuana possession and Reaves also had an outstanding warrant and was discovered having fraudulent credit cards, police said. Perkins, the driver of the Altima, was charged with having a suspended license. Police said Perkins had four fraudulent credit cards.